swimming pool, and large open space garden. Airport is about 60 minutes drive and Tampa Airport about 75 minutes. coast can be reached in about an hour. ideal for those lazy days spent basking in the Florida sunshine. is also equipped with a large double car garage. 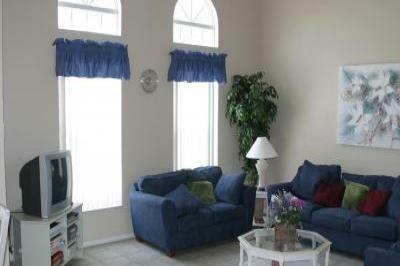 cable network is provided in the family lounge and the master bedroom. toaster and a full set of cutlery, crockery, utensils and housewares. all gas, electricity, linens, towels and local calls. located on the first floor with a powder room or half bath. for boys and girls bedrooms.